All primary ureteropelvic junction repairs can potentially fail, and in such a case a second operation is usually needed. Failure rate after laparoscopic pyeloplasty is approximately 5%. However, little is known about the best management after failure of laparoscopic pyeloplasty for primary ureteropelvic junction obstruction. 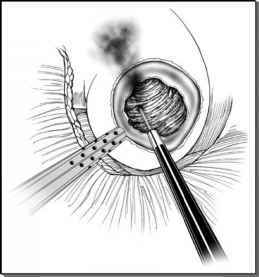 ■ Comprises balloon dilatation, laser, cold knife, and cutting balloon endopyelotomy. ■ Is used in the majority of patients who failed primary laparoscopic repair. ■ Has an overall success of 77.7% after a follow-up period of 25.5 months. ■ Is performed to treat short (<1 cm) recurrences amenable to incision or dilation performed at the same setting of the retrograde pyelography that confirmed the presence of recurrent obstruction. ■ Has a low complication rate (crossing vessels, if existent, were already displaced during the primary laparoscopic procedure and therefore could not account for failures or postoperative bleeding).